Also Called: Northern red oak. Trunks: Large, 2-4 feet in diameter, lower half usually without branches; crown high, broad, rounded; branches few, large, wide-spreading; bark gray or dark brown; furrows shallow or deep; ridges firm, broad; inner bark light red. Twigs: Slender, stiff, green to reddish-brown to dark brown; terminal bud 1/8 to 1/4 inch long, egg-shaped, glabrous, reddish-brown, tip pointed; lateral buds clustered near tip; leaf scars half-round; bundle scars 10 or more. Leaves: Alternate, simple, deciduous, egg-shaped, 5 to 10 inches long, 2.4 to 5.5 inches wide, 5-11-lobed, firm; lobes oblong, tapering from broad bases to pointed tips; largest lobes near middle of leaf; teeth few, large, bristle-tipped; spaces between lobes wide, rounded, barely reaching half way to midrib; upper surface dark green, glabrous; lower surface paler with few hairs at base of side veins; base broadly wedge-shaped to nearly squared; stalk 1-2 inches long; leaves turn orange or reddish-brown in autumn. 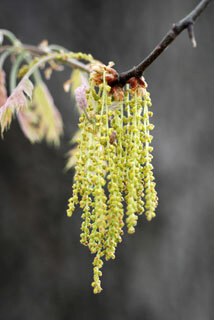 Flowers: When leaves half grown; monoecious (male and female flowers on same tree); staminate catkins 2.8 to 5 inches long, 30-35-flowered, hairy; calyx 4-5-lobed, greenish-brown; corolla absent; stamens 4-5; anthers yellow; pistillate flowers solitary or in pairs in axils of immature leaves, small, spherical, covered with green or brown scales; stigmas 3-lobed, curved, spreading, green. Fruit: Autumn of second year; acorn sessile or short-stalked; cup saucer-shaped, 1/5 to 1/2 inch high, .75 to 1.2 inch wide, enclosing only 1/4 to 1/3 of nut, upper end turned in; scales closely overlapping, somewhat glossy, slightly hairy, reddish-brown, margins dark; nut oblong-ovoid, .6 to 1.2 inch long, reddish-brown, 1-seeded; base flat; kernel pinkish, very bitter. Habitat: Stream banks, flood plains, moist slopes, north and east-facing wooded bluffs; limestone, sandstone, chert, or granite soils. Uses: Native Americans applied an infusion of bark to to chapped skin and took an infusion of bark for asthma, coughing, and diarrhea. The bark was chewed for mouth sores and used to make a black dye. The acorns were used for food after soaking them with basswood ashes and water to leach out the bitter taste. The wood was used for lumber, furniture, interior finishes, railroad ties, and wagon spokes and rims. Comments: Ornamental shade and lumber tree. The common name alludes to the reddish-colored inner bark. The wood is heavy, hard, strong, coarse-grained, light reddish-brown.